On the morning of September 27, Zhou Zhenglong went on trial in Xunyang (Shaanxi) for fraud and illegal possession of firearms ammunition. 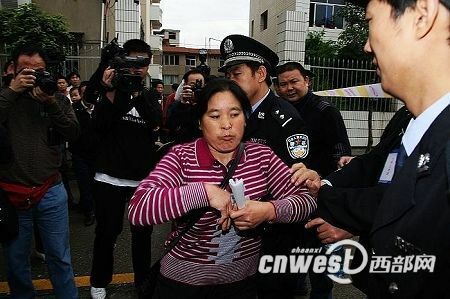 At 7:30am, 30 minutes before the trial began, Zhou's wife Luo Dacui came to the People's Court in Xunyang. The police had already set up a cordon, so she and the reporters could only wait for news 50 meters away from the courthouse. Luo Dacui told the reporters that she petitioned the court to let her attend the trial as well as hire a new lawyer yesterday. She wanted to see her husband whom she had not seen ever since he was taken away in April for interrogation. At 8:20am, Xunyang court judge Ma Zhijun came out to tell Luo about the court's decision. First, Luo Dacui and her son Zhoug Song are witnesses in this case and therefore the court rules prevent their presence at courtside. But the court did not indicate whether Luo Dacui would actually be asked to testify. Secondly, Zhou Zhenglong is mentally competent and he has selected his own lawyers. Thus, nobody else has the right to request a change of lawyer on his behalf. After hearing the court's decision, Luo Dacui clearly looked disappointed. She told the reporters that she cannot understand why she was not being allowed to attend the trial. Her son stayed by her side and comforted her. He said that his father is a good man as well as a good hunter and he wished him the best of luck. At 10:30am, Luo Dacui received a telephone call. During the phone conversation, she got emotionally excited. She tried to breach the police line. But she was stopped twice. 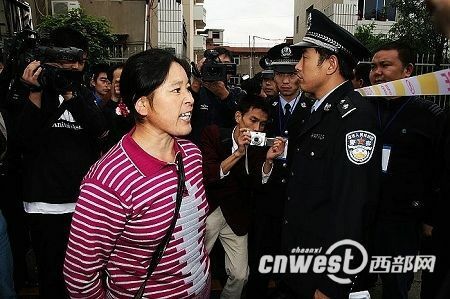 [Postscript] After the verdict was announced, Luo Daqui was about to speak to the press when her telephone rang. After taking the call, she left quickly without speaking. 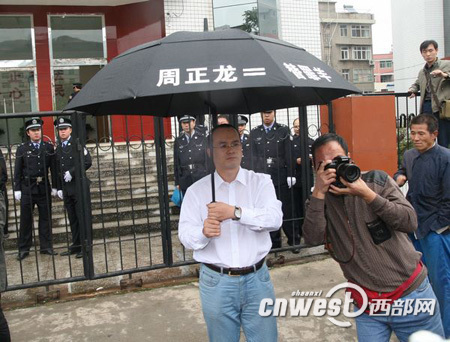 At the court trial yesterday, the famous "anti-tiger camp" representative Hao Jingqsong took out a black umbrella on which was printed the words" Zhou Zheng-long = Scapegoat." The dates "07.10.12" and "08.06.29" were also printed. 07.10.12 was the date on which the Shaanxi provincial Department of Forestry held the press conference to announce that the South CHina tiger is alive and well. 08.06.29 was the date on which Zhou Zhenglong was detained. According to Hao, Zhou is suffering on behalf of the government officials behind the scene. Hao Jingsong told the press that the Xunyang court turned him down twice for a courtroom seat on the grounds that all seats have been taken. He said that "the court lied." 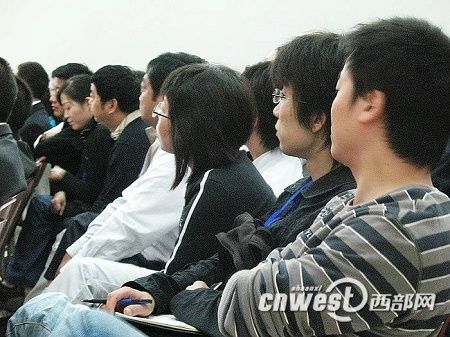 In addition, many media reporters did not pass the qualification examination of the county publicity department and were not admitted either. Hao Jingsong told the reporters: "If Zhou Zhenglong does not disclose signfiicant information at the trial," Hao would denounce the 13 cadres and public servants involved in the case for dereliction of duty to the Supreme Procuratorate. Hao said: "I'm prepared to petition the State Department of Forestry to reveal all information. I hope that they will disclose the information about who was involved in the South China tiger investigation, the investigative process and results. The taxpayers have a right to know where their money went!" At 8:00am on September 27, it was drizzling but several hundred people were already gathered outside the police line in front of the Xunyang county courthouse in Shaanxi province. The quiet streets of Xunyang county were filled by more than 70 reporters from more than 30 media outlets from all over China. There were were also local cadres and people who wanted to attend the court proceedings. At 8:30am, the 144 seats in the court were filled. Outside the courthouse, many people who were not admitted stood in the drizzle to wait for news. Zhou's wife Luo Dacui is a witness in the case and therefore could not attend the trial. The famous "anti-tiger faction" representative Hou Jingsong was a favorite for the reporters to interview. At 8:30am, the judge panel of three announced the start of the trial. The prosecutor charged that the defendant Zhou Zhenglong heard the Shaanxi provincial tiger investigation team member Yu Xiaoping and others saying that a huge reward would be given to anyone who takes a photo of a wild South China tiger. Therefore, he got the idea to stage a photo using a wall poster to defraud the government. Zhou Zhenglong made up the excuse that a relative needed a poster of a tiger to "ward off evil" and asked the local villagers Yu Hai and Peng Huicai to products such a poster. He then took photos of that wall poster. On September 12, 2007, the Shaanxi provincial Department of Forestry announced at a press conference in Xi'an that a live wild South China tiger has been discovered in Zhengping county, Shaanxi province. A reward of 20,000 yuan was given to Zhou Zhenglong. During the heated debate over the veracity of the South China tiger photos, Zhou Zhenglong made a wooden tiger paw and claimed that he had found the signs of activity of the South China tiger. On May 18, 2008, the police searched the residence of Zhou Zhenglong to look for evidence (note: they found the wall poster and the wooden tiger paw). They found 93 bullets to be used for military rifles. The prosecutor charged that the evidence for the fraud and illegal possession of ammunition was clear. In defense against the charges, Zhou Zhenglong said: "I faked the tiger photos. But it is inaccurate to say that I deceived the cadres and obtained the reward money by fraud. After I took the tiger photos, I reported to the county leaders and they arranged for me to go to Xi'an. I never asked anyone from Zhengping to the provincial Department of Forestry for money. They offered to give me 20,000 yuan on their own. Therefore does not constitute fraud." 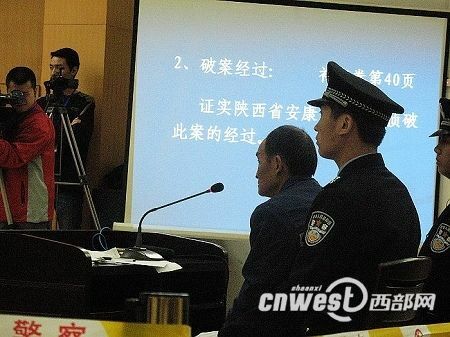 In order to establish a motive for Zhou Zhenglong to fake the tiger photos, the prosecutor produced large amounts of testimony. Zhou Zhenglong's relative Xie Kunyuan lent the cameras and he testified: "Zhou Zhenglong told me many times that he risked his life to take the photos, which should be worth a lot of money. He thought that 20,000 yuan was much less than he expected." Other Zhengping county cadres testified that Zhou Zhenglong said that his son was out of work and wanted the county government and the Department of Forestry to find work for him in return for using the photos at the press conference. 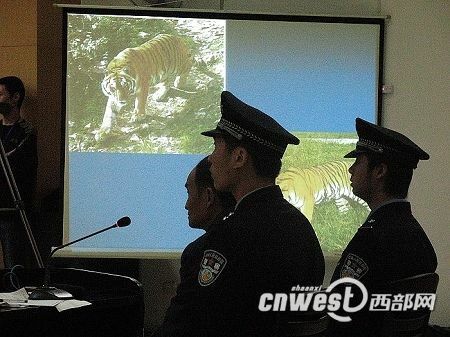 Besides Zhou Zhenglong's own statement and the material evidence, the prosecutor offered the testimonies of 20 witnesses to show that Zhou Zhenglong faked the tiger photos for the sake of the reward money. During the presentation of these testimonies from other people, Zhou Zhenglong continued to defend his own action. But he had nothing to say about the testimonies from his wife and son concerning how he obtained the photography equipment and got the reward money. Finally, Zhou Zhenglong said: "I admit that I was wrong and I will accept the punishment. But I did not ask for the reward money, so this was not fraud. I have written a confession before. I hope the court will be lenient in judging me." 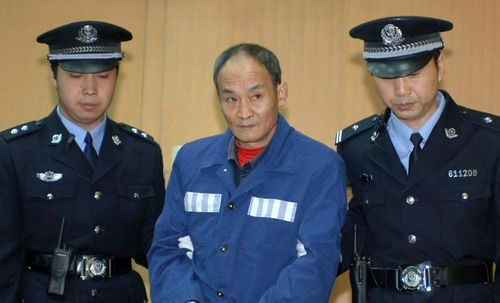 The prosecutor stated that Zhou Zhenglong used deception to gain the reward money. This action constitutes fraud with bad social influence. Although Zhou Zhenglong's fake South China tiger photos took place in the small county of Zhengping, its influence went far beyond Zhengping and Shaanxi province to reach the entire country and even overseas. His action caused a national government department to release incorrect information and sowed doubts among the media and the public for seven months. Not only did Zhou refuse to admit his crime, but he continued to fabricate the tiger paw marks to cover up his crime. He wasted a lot of administrative resources and seriously damaged the reputation of the government. 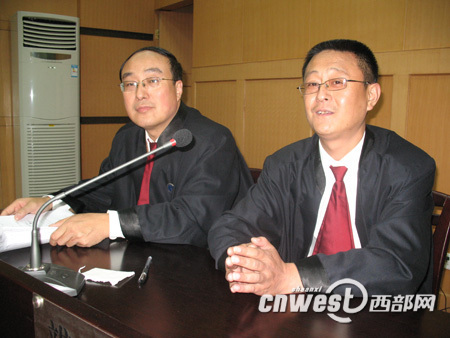 Zhou Zhenglong was defended by his lawyer Zhang Yong and Liu Xin. They said that the fraud was successful because the Department of Forestry did not carry out its duties by conducting a thorough investigation. The 20,000 yuan reward money was the result of the negotiation between Zhengping county and the provincial Department of Forestry, and contained a large degree of arbitrariness. Zhou Zhenglong merely accepted the decision. The bad social influence was not caused by Zhou Zhenglong himself, and therefore the sentencing should take this into consideration. The relevant administrative departments failed to organize experts to make an scientific study of the evidence and immediately held a press conference to tell the world. Afterwards, these departments chose to ignore the strong media attention and public skepticism. As a result, public trust in the government suffered serious erosion. There is no reason to make Zhou Zhenglong bear all these consequences, and it is also unfair. At 4:40pm, the court announced a recess. Thirty minutes later, the judges came back and announced their verdict. The judge panel said that the defendant Zhou Zhenglong was guilty of faking the South China tiger photos in order to claim reward money from the relevant government departments. The money was a sizeable sum, and therefore this was fraud. 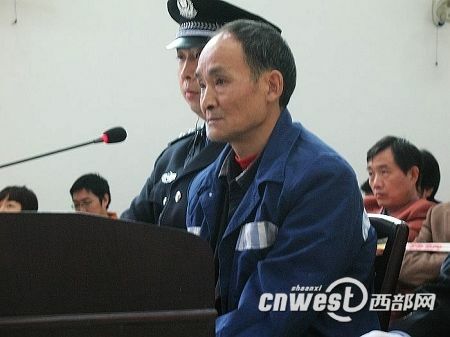 The defendant Zhou Zhenglong also violated the relevant state laws on arms control by possessing military-use ammunition. Therefore, he is also guilty of illegal possession of ammunition. Based upon the facts surrounding the crimes, the nature of the crimes and the ensuing harm to society, the court sentenced Zhou Zhenglong to two years in prison over the fraud charges in accordance with the criminal law code of the People's Republic of China. In addition a fine of 2,000 yuan was imposed. 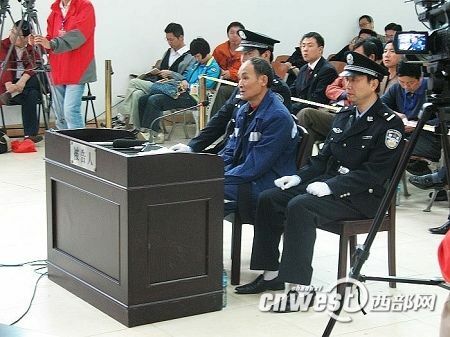 Zhou Zhenglong was also sentenced to 1-1/2 years for illegal possession of ammunition. The two prison terms were allowed to overlap for one year, so that the net total was 2-1/2 years. The 20,000 yuan that Zhou Zhenglong obtained by fraud and the 93 military-use bullets will be confiscated. 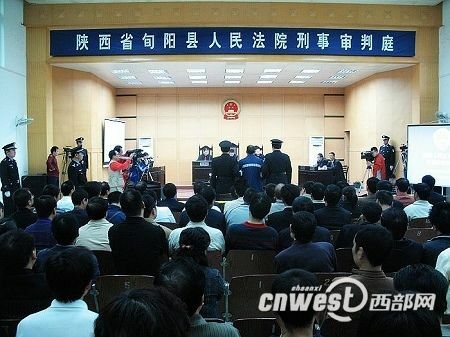 During the statements by the prosecutors and the defense lawyers, both sides spoke about the lessons that were learned from the South China photos incident. The prosecutors believed that even if one loves money, one has to obtain it properly. Even if you are poor, you cannot give up your character. Zhou Zhenglong's actions showed that something fake can never be turned into reality because it will never withstand the test of time and the skepticism of the public. The case of Zhou Zhenglong shows that those who break the law will be brought to justice. At the same time, the defendant Zhou Zhenglong was able to get away with the fake photos because the relevant departments were sloppy in their work for which they have also been sanctioned. This warns public servants that they must carry out their duties seriously in accordance to their work procedures. Only then can potential wrong-doers be discouraged from hurting the national interests. The defense lawyers thought that this simple criminal case revealed many issues when it bloomed into a national affair. These issues show that there have been some imperfections in the building of a transparent, responsible and trustworthy government. Improvements are much needed. If these issues can be advanced and solved, then this case will have served a purpose that benefits the nation and its people. Therefore, the defense lawyers urges the various levels of government to respect the facts and correct their mistakes; to respect the law and not act rashly; to respect science and not regard the experts as decorations; to respect public opinion instead of ignoring it.